Poles love herring -- pickled, creamed, fried, whole, fillets -- and in an appetizer recipe known as rollmops or rolmopsy in Polish. The derivation of the name is from the German rollen or "to roll" plus mops for "pug dog." The dog connection is less clear. 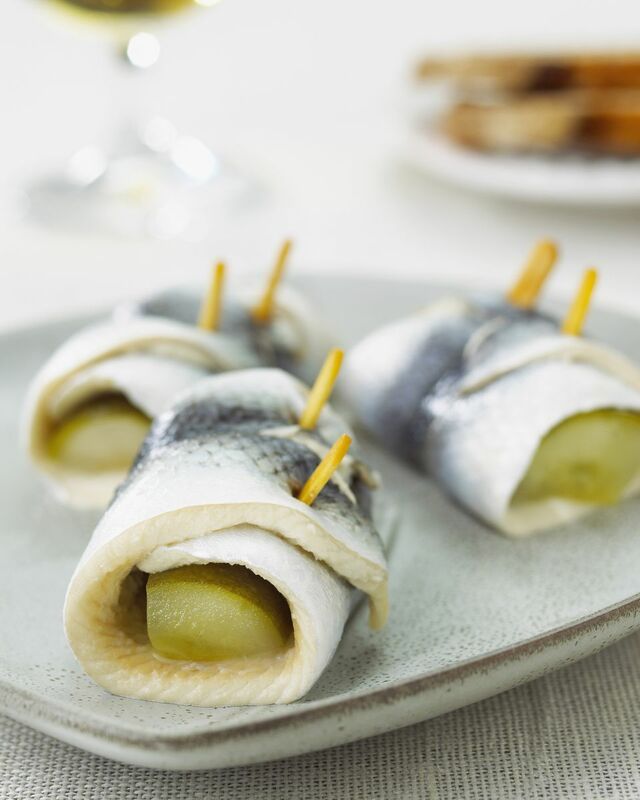 Easy rollmops are made by using store-bought pickled herring that is drained and wrapped around your choice of dill pickles, pickled mushrooms or pickled onions. This makes a great starter course any time of the year but especially for Polish Christmas Eve or wigilia and New Year's Eve celebrations. Here is another rollmops recipe courtesy of chef Marek Widomski of Kraków which requires whole salt fillets that are cleaned, stuffed and marinated for several days. And here is another recipe for herrings in oil (not rolled) also from chef Marek. Place a slice of dill pickle or pickled mushroom or pickled onion at one end of each of the 12 drained pickled herring pieces. Roll and skewer with a fancy frilled toothpick. Cover with plastic and refrigerate until ready to serve. At time of service, if desired, drizzle rolls with reserved pickling juices or serve the juices separately in a small bowl for dipping. Garnish each rollmop with a sprig of dill or parsley.